Harry Potter themed layer cake with fluffy vanilla buttercream frosting! 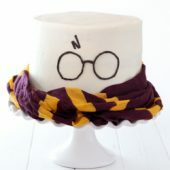 A fun birthday or celebration cake for any Harry Potter fan! Preheat oven to 350°F. Lightly coat two 8-inch round cake pans with baking spray. Line the bottom of each pan with parchment paper. Optionally, wrap cake pans in bake even strips to prevent domes from forming. In the bowl of a stand mixer, with paddle attachment, cream together 1/2 cup butter with 1 cup sugar. Mix in 2 eggs, adding one at a time. Beat until fully combined. Mix in 2 tsp vanilla, 1/2 tsp salt and 1Tb baking powder. Mix until just combined. Measure out 2 cups and 3Tb cake flour, plus 1C sour cream. Alternate additions of each until fully combined and no streaks remain. For the golden layers, add 6 drops lemon yellow Americolor and 4 drops gold Americolor. Mix well until batter is evenly colored. Divide between prepared pans. Bake for 30 minutes or until a toothpick inserted comes out clean. Allow cakes to cool before carefully inverting onto 8-inch cake boards. Flip again and cool completely on a wire rack. Repeat the steps up to this point to create two maroon layers of cake. When ready to tint the batter, add 6 drops Maroon Americolor and 2 drops Red Red Americolor. Bake and cool as directed. When cakes have cooled completely, wrap each cake in 2 layers of plastic wrap. Store in the refrigerator for 6-12 hours or overnight. Prepare frosting. In the bowl of a stand mixer, with paddle attachment, beat together butter and shortening until light and fluffy, followed by vanilla. Add one cup of powdered sugar at a time until fully combined. Lastly, mix in heavy cream. Beat until fully combined and completely smooth. If cakes have domes, use a serrated knife or cake leveler to carefully remove the domes. Place one layer of cake on a cake turn-table or cake stand. Add roughly 4 large cookie scoops worth of frosting to the top. Spread into an even layer. Add a second layer of cake, of an alternate color, top off with frosting. Repeat with remaining layers, alternating colors as you go. Top off the last layer of cake with frosting. Spread into a thin and even coat over the entire cake. This will act as your crumb coat. Carefully transfer crumb coated cake to the fridge to chill for at least 1-2 hours. Cover remaining frosting with plastic wrap until ready to proceed. Set aside up to 1/2 cup of frosting. Cover and set aside for later. When your crumb coat is firm, remove from the refrigerator. Add a generous amount of frosting to the top of your cake, working it out and down the sides. Using a bench scraper and a large offset spatula, smooth sides and top of cake. Transfer cake to the refrigerator for 1-2 hours to firm up. Tint reserved frosting with drops of Americolor chocolate brown, eggplant and navy blue. Add spoonfuls of cocoa powder to darken the color. Continue adding color and cocoa powder until desired shade is reached. If necessary, thin out frosting a teaspoon at a time of heavy cream until desired consistency is reached for piping. Add tinted frosting to a small piping bag fit with a small round tip. Use a small round cookie cutter or other small round option to gently press into the cake to create a template for the glasses. Carefully pipe glasses and scar. When ready to serve, carefully cut with a sharp knife. Cake slices may be served as 4 layers each or divided into 2 layers per person to serve a larger group. Recipe serves roughly 12-24 plus.